The Law Office of Bryan E. Cameron is a Sayville, New York, firm that focuses mainly on criminal law but also provides knowledgeable, efficient services for real estate and estate law. If you have been charged with a crime, your future and freedom may be at risk. You may also face costly fines and loss of important privileges. You need skilled and experienced representation to defend your rights and interests. For 15 years, lawyer Bryan Cameron has defended thousands of clients on all kinds of charges, including driving while intoxicated (DWI, also often called DUI), a variety of other driving offences and misdemeanors, and felony charges such as theft, drug trafficking and domestic violence. As a former prosecutor, Bryan Cameron is familiar with how the other side works, and can anticipate their strategies. At every stage of the process, our firm will work diligently to protect your rights. Our particular focus within criminal law is motor vehicle offences such as DWI/DUI, traffic violations and speeding, failure to obey traffic laws, driving without a license, reckless driving and leaving the scene of an accident. We can also represent you on charges of violating transportation or environmental laws regarding vehicles. Let our experience protect you from fines, jail time, loss of your vehicle, loss of driving privileges, and higher insurance premiums. Besides criminal law, we provide skilled, experienced representation for real estate law, including purchase and sale of residential and commercial property, leasing and foreclosure defense. Our office can also help you plan your estate and prepare your wills, trusts, powers of attorney and health care directives. We accept credit cards. Spanish is spoken in the office, which is conveniently located downtown. 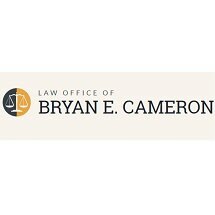 Call the Law Office of Bryan E. Cameron for a free consultation.